Janger performing art is still able to attract the public because of its ability to adopt various local languages in Banyuwangi. In addition to apply Javanese language, it also utilizes Using, Madurese, and Indonesia languages. Nevertheless, the actors of Janger cannot simply mix language. Appropriateness in applying and mixing languages is a prerequisite for being a successful actor. This article aims to analyze the ways in which actors adopt four languages in their performances. Therefore the relevant approach used is the perspective of orality. This approach leads to the answer that the local languages are the cultural cohesive device between Janger performing art and its audiences. Although using different languages, the three major ethnic groups in Banyuwangi, namely Using, Javanese, and Madurese can together become Janger supporters because symbolically all of them feel become the owner of Janger. Key words: Janger performing art, cultural cohesive device, local languages. ILHAM, Mochamad. Local Language as Cultural Cohesive Device in Janger Performing Art. 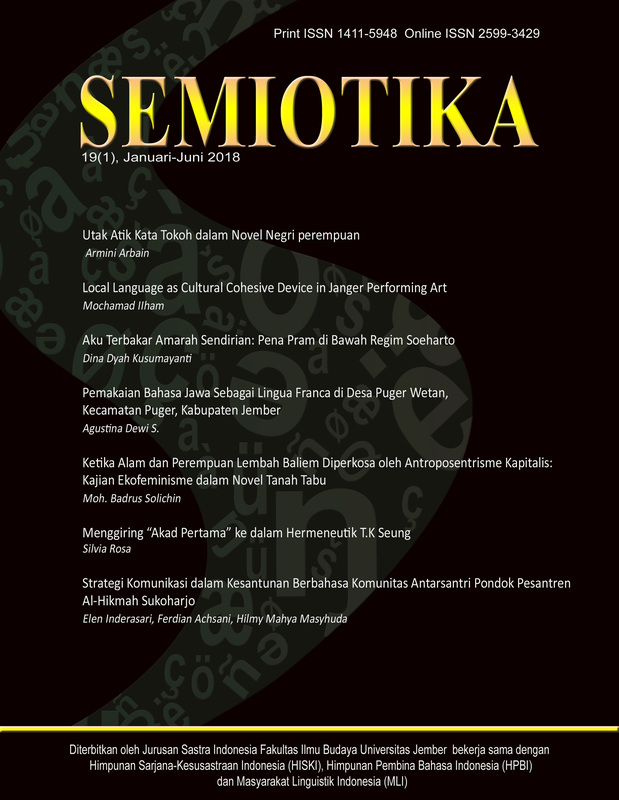 SEMIOTIKA: Jurnal Ilmu Sastra dan Linguistik, [S.l. ], v. 19, n. 1, p. 7-24, aug. 2018. ISSN 2599-3429. Available at: <https://jurnal.unej.ac.id/index.php/SEMIOTIKA/article/view/6771>. Date accessed: 26 apr. 2019. doi: https://doi.org/10.19184/semiotika.v19i1.6771. 1. Pemilik akun silakan klik Login.